We’d love your help. Let us know what’s wrong with this preview of The Composting Toilet System Book by David Del Porto. From systems for cottages to year-round systems with micro-flush toilets and graywater gardens, the wide range of ecological recycling toilet options are featured in The Composting Toilet System Book. More than 40 systemsA including those you can buy and those you can buildA are featured. 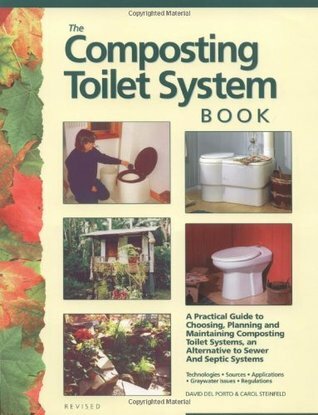 To ask other readers questions about The Composting Toilet System Book, please sign up. This book has some good parts. It seems that the authors are quite into high-tech solutions. My rating reflects how much I got out of it. Pg. 234: My copy from the Library has dirt damage like it was on a compost file. Pg 25: Composting is better than drying. It makes nutrients available to plants to use. Pg 31: Some states allow composting toilets. Pg 40: I don't remember leachate in other books. Pg 61: Guidelines if used on food. Temperatures must reach 160 degrees. Use only on crops that don't touch the ground. Put at least 6" below the surface. Dilute urine eight to one. Pg 88: Diapers an My rating reflects how much I got out of it. Pg 88: Diapers and tanpons add a lot of bulk. Must watch for plastic. Pg 70: Sources and products ww.jademountain.com, www.lehmans.com, www.realgoods.com. Pg 103: One desing uses the buss word permaculture. Pg 108: Bucket to outdoor composting plan; seems to be directly from "Humanure Handbook". This would be cheap but labor intensive. Pg 143: Wow this buildings graywater is only 10CFU per 100 milliliter compared to 200 CFU for swimming pools. Pg 174: Simple ways to use Graywater. Use a basin in your sink and dump on plants. Save warm us shower water to flush the toilet.